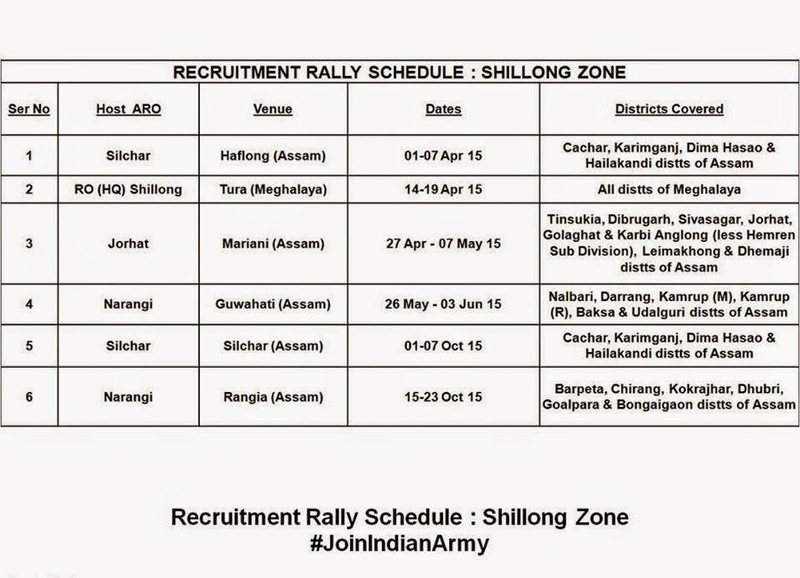 1- Host ARO, Silchar, Venue Halflong (Asham) on 01 to 07 April 2015. Districta Covered Cachar, karimganj, Dima Hasao, Hailakandi, of aasham. 2-Host ARO, RO(HQ)Sillong, Venue Tura(Meghalaya) on 14 to 19 April 2015. All Districts od Meghalaya Covered. 3- Host ARO Jorhat, Venue Mariani(Assam) on 27 April to 07 May 2015. For Tinsukia, Dibrugarh, Sivasagar, Jorhat, Golaghat and Karbi Anglong (Less Hemren Sub division), Leimakhong and Dhemaji distts of Assam. 4- Host ARO Narangi, Venue Guwahati (Assam) on 26 May to 03 Jun 2015. For Nalbari, Darrang, Kamrup(M),Kamrup(R),Baksa and Udalguri distts of Assam. 5 Host ARO Silchar, venue Silchar (Assam) on 01 to 07 Oct 2015. for Cachar, karimganj, Dima Hasao & Hailakandi Distts of Assam.